I quietly celebrated my birthday recently with a trip to visit my sister in Washington. I always so enjoy traveling to the Northwest in the fall. It reminds me of the East Coast with all of its colorful trees and other seasonal sights like pumpkins on doorsteps and endless piles of leaves. 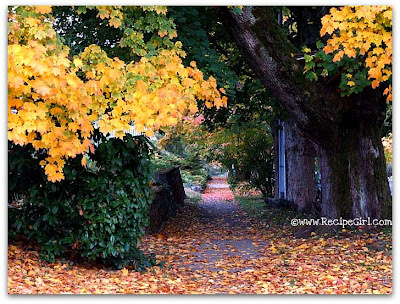 On a morning walk through my sister's neighborhood, I was able to capture a snapshot of the local autumnal color. We just don't see this sort of thing in Southern California! 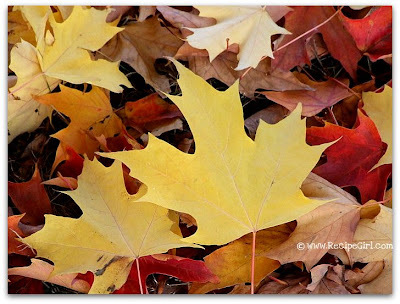 The leaves in my yard at home eventually fall off the trees, but they never manage to turn beautiful shades of yellow and reds before they do so. They're just dead. 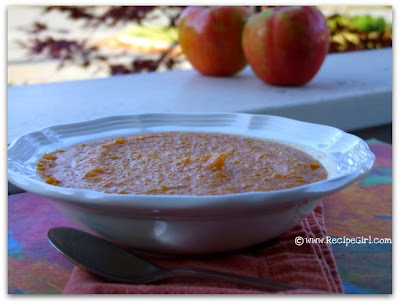 Since we were all wrapped up in the beauty of the season, we decided to choose a recipe that would embrace it: Roasted Butternut Squash Soup with Apples and Garam Masala. Butternut squash is abundant these days. I've been seeing it on the blogs in muffins, pasta and even pizza. There are a lot of variations on butternut squash soup too... but this one had some nice twists to it. 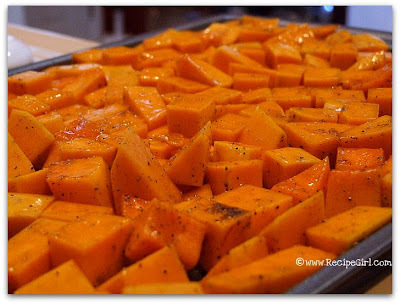 The butternut squash is tossed with olive oil, maple syrup and garam masala (a spice with amazing scents and flavor), and then it's roasted until soft and caramelized. If you can't locate the spice Garam Masala, you can always make your own. Apples are sauteed with wine, shallots and broth. As soon as everything is all softened up, it's blended together until pureed. The original recipe calls for straining the solids. We gave the soup a taste after blending and were perfectly happy with the texture, so we didn't bother straining. 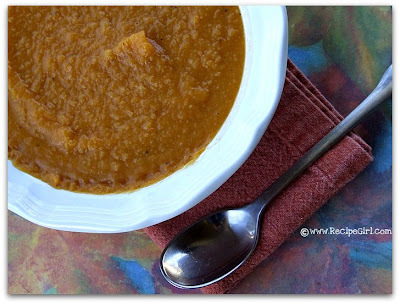 A perfect blend of spice, sweetness and earthiness, we enjoyed our fall soup very much. Thickness of the soup can easily be adjusted by using more or less broth (and straining/not straining). Thanks for a great birthday weekend Sis! Say what you want about all of that rain you get up there... it sure is a beautiful place to live (and play). I'd happily stomp through puddles and trudge through a little bit of snow to be able to experience the seasons like you do.